With its rows of taxidermy animal heads and displays full of the unholy hybrid animals straight out of Bavarian folklore, Munich’s Deutsches Jagd und Fischereimuseum (Museum of Hunting and Fishing) looks more like a surprisingly clean pagan chapel, which is unsurprising since the whole thing is housed in a 13th-century church. Originally opened in a German castle in 1938, the museum was created in response to public demand spurred on by the area’s long tradition of game hunting. Unfortunately it did not last very long and the taxidermalogical assemblage, which included a prestigious antler collection, was closed with the onset of World War II. However, undeterred the museum reopened in 1966 inside of the former Augustinerkloster, a defunct Augustinian abbey that had stood in the city since the 13th century. Elk heads were posted at the stations of the cross and the central crucifix was replaced with a piece of taxidermy. Finding more stability and success in the lovely new space, the museum’s collection of animals (and their heads) continued to grow and the scope was expanded to include exhibits related to fishing in the 1980s. However alongside the sprawling collection of over 1,000 taxidermy beasts, the star attraction of the museum is the small selection of mammalian-avian monstrosities known as “wolpertingers.” A European cousin to the equally mythic American Jackalope, wolpertingers are rare chimerical creatures said to inhabit the dense Bavarian forests. 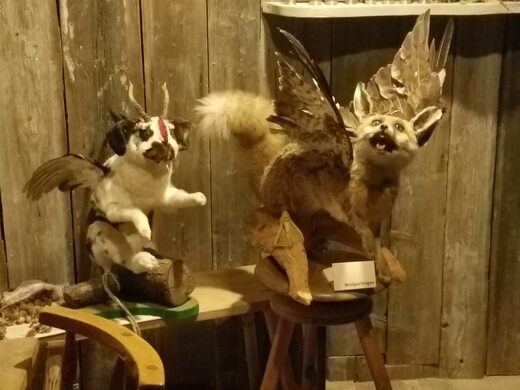 In reality the novelty taxidermy are simply imaginative mashups of various small game and bird parts creating beasts that often resemble vermin with horns, fangs, and wings. From the legendary wolpertingers to the centuries old church they are housed in, fans of taxidermy don’t need to hunt after any better museum than the Deutsches Jagd und Fischereimuseum. The museum is easy to find and just off the main pedestrian mall.